If there is one dessert that screams Canadian then I guess it would be butter tarts. This dessert (little did I know) was and is my husband’s all time favourite. I have to admit I would never say no to a butter tart. Last weekend it was a dear friend’s birthday and we were invited over for dinner. They do things a little different here. When it is your birthday it is up to you to host the get together or buy everyone a cappuccino and cornetto. Lucky for us our friend is an amazing cook so my husband volunteered me to make the dessert, no problem there, I love sharing my homemade desserts. So I said why not butter tarts? 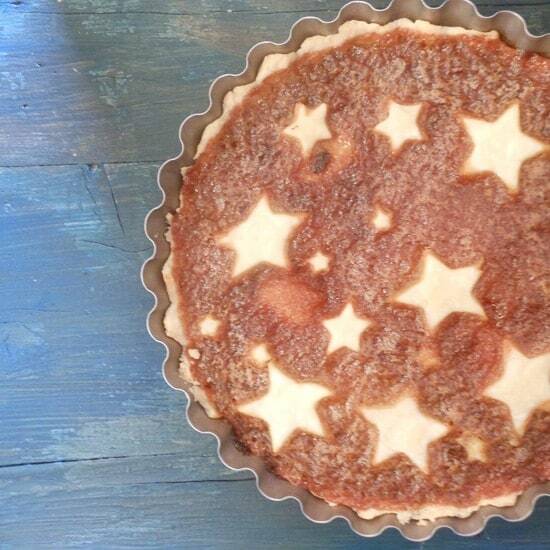 I wanted something a little more formal, so why not a pie? And there you have it. 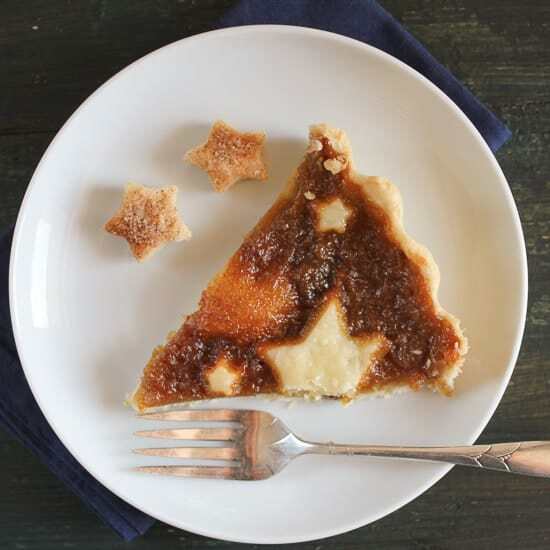 A Butter tart pie. 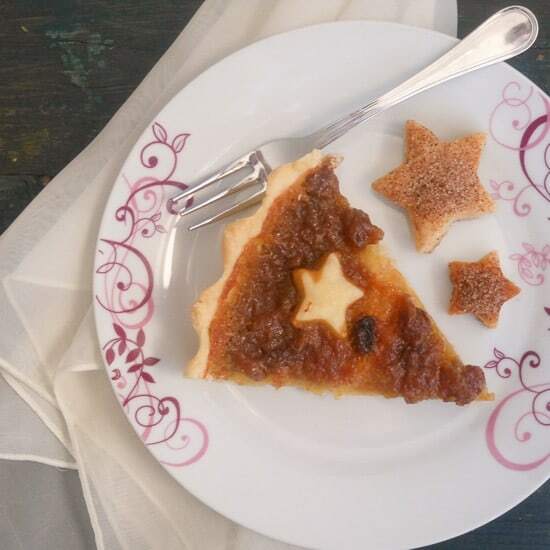 This pie is so rich and decadent, with homemade pastry and plump raisins, brown sugar and corn syrup, what’s not to like about it? And how about some of that sweet syrup dripping down your chin! Makes my mouth water just thinking about it. My daughters weren’t too impressed that the pie was leaving the house, but of course I thought of them too (or maybe me and their father also). I made two, can’t have just one slice. This butter tart pie is so amazing just by itself that there is no need to dress it up with ice cream or a whipped cream topping. The next best thing to do with any left over pie dough is to make cinnamon cookies or twists, my grandmother used to make these for her kids when she had left over pie pastry and then, of course, my mother would make these for me, my sisters and my Dad and now I make them for my family and friends. They have always been a big hit with my Italian friends and family, next to the pie of course. 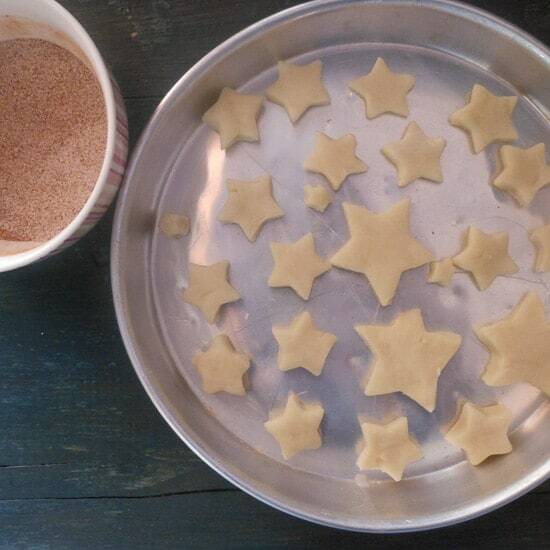 They are so easy and so yummy and now you know what to do with any left over pastry. 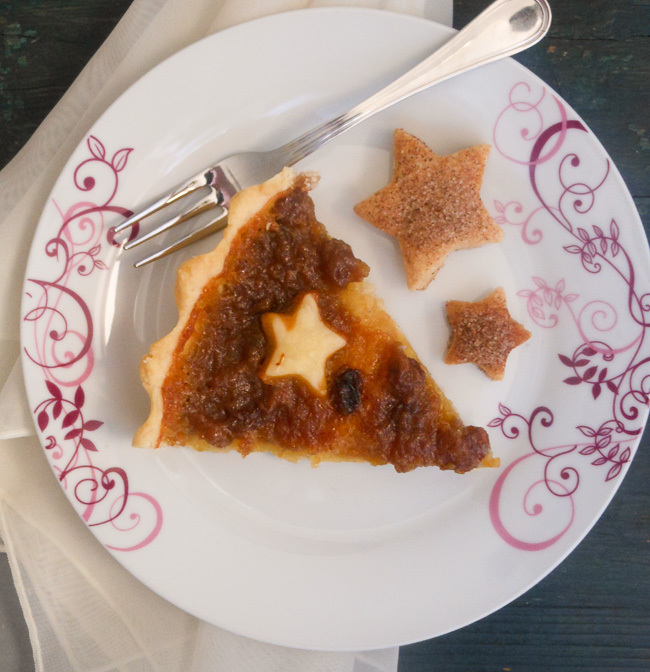 So try a slice of butter tart pie and a couple of cinnamon twists and there will be no looking back! Enjoy! 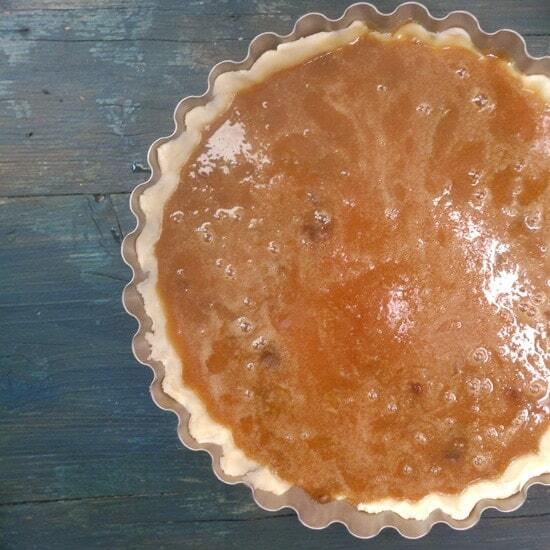 Butter Tart Pie, a flaky, buttery pastry, filled with a mouth watering brown sugar, raisin filling. Pre- heat oven to 400° (200 celsius) degrees. Mix corn syrup and brown sugar in a small pot, cook gently over low to medium heat for approximately 5 minutes, stirring constantly (do not bring to a boil, will become syrupy), then cool slightly. In a medium bowl beat eggs slightly, add the corn syrup, brown sugar mixture, beating continuously with a wooden spoon, then add butter,salt and vanilla, stirring to combine. Drain the raisins. In a medium bowl with a fork lightly mix flour and salt, with a pastry blender cut in the butter until it resembles coarse crumbs. 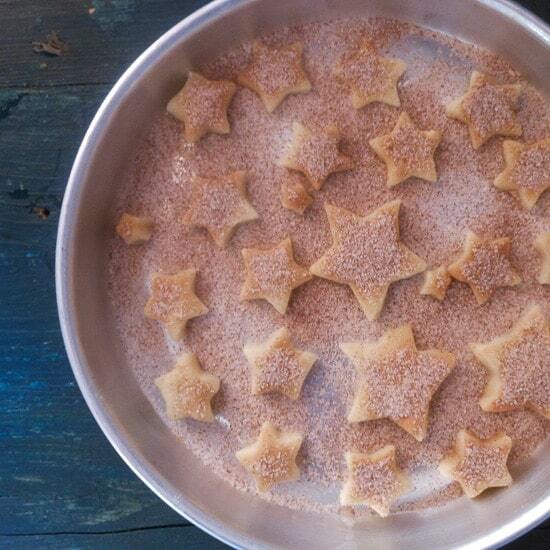 Add cold water 1 tablespoon at a time and mix lightly with a fork after each addition, until the pastry comes together. Shape into a ball with your hands and then refrigerate for 30 minutes. Remove from the fridge and knead softly a few times to soften the dough. Cut the dough in half. Roll each piece into a circle on a floured surface, make sure to flour the rolling- pin also, place dough in pie pan (9 inch / 8.6 centimeter). Sprinkle with drained raisins, then fill with butter tart filling. Bake in 400° (200° celsius) oven for 15 minutes, then lower to 350° (180° celsius) and bake for an additional 15-20 minutes (till crust is golden, filling will be lightly browned but still bubbling). Let cool before serving. Enjoy! 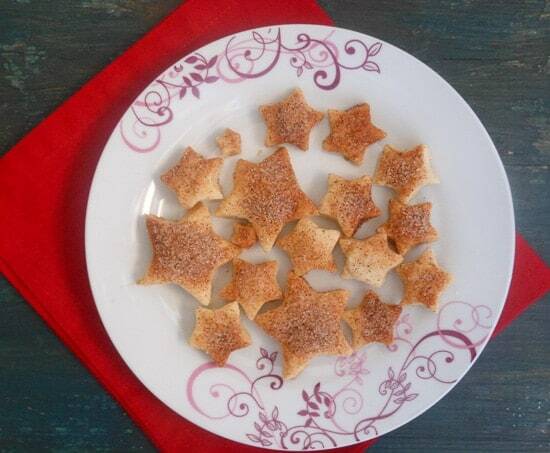 In a small bowl mix 1 tablespoon (15 grams) sugar and 1 teaspoon (5 grams) cinnamon. With the extra pastry, cut into strip and twist or use a small cookie cutter to make shapes, then sprinkle with the sugar/cinnamon mix and bake in 350° (180°) degree oven until golden.